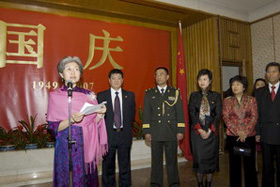 In the evening of September 28, 2007, the Chinese Embassy in the UK held a Reception for the foreign guests in celebration of the 58th Anniversary of the People's Republic of China. More than 300 guests from all walks of life in UK, including Lord Triesman, Parliamentary Under Secretary of State for Intellectual Property and Quality, John Prescott, former Deputy Prime Minister, Lord McNally, Liberal Democrat Leader in the House of Lords, Christopher Hum, former British Ambassador to China, Michael Charlton, CEO of Think London, Stephen Perry, Chairman of 48 Group Club, and Lionel Barber, Editor-in-Chief of the Financial Times, were present. Mitropoulos, Secretary-General of International Maritime Organization and the diplomatic envoys of more than 20 countries to UK also attended. H.E. Mme. 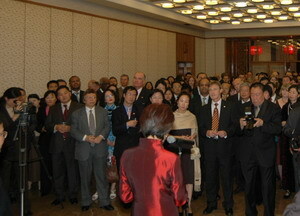 Fu Ying extended warm welcome to the guests and thanked them for their understandings and support to China. She said that the 58-year history of the People's Republic of China could be separated into two parts, a lot lessons was left for China to learn from in the first part and China made great economic achievements in the second part. China maintains social stability and the life standard of the people is being continuously improved. The GDP of China reaches 2,700 billion dollars and is No. 4 in the world, while the GDP of China was less than 400 billion dollars 28 years ago. The foreign trade and foreign investment in China are both No. 3 in the world which are the engine of the Chinese economy. The R&D input of China is No. 2 in the world, which shows that China is advancing toward the modernization. According to the latest forecast, China is contributing 16% of the world economic growth this year surpassing USA for the first time. Fu Ying noted that though China had made great achievements, it still faced many challenges e.g. how to control the environmental problems, how to narrow the regional gap and how to improve the ruling capacity. The 17th CPC National Congress to be held in October will seriously study the policies and measures to solve the problems. Fu Ying said that the level of China's openness was unparalleled, about 120 million foreign visitors come to China and 35 million Chinese go abroad every year. China has never been so closely linked with the world like nowadays. The 2008 Beijing Olympic Games expected by the whole country will further raise the international status of China. 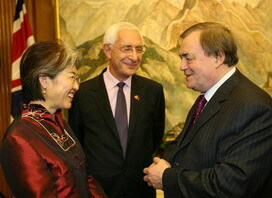 Fu Ying highly appraised the Sino-UK relations, she said that the opening of the Exhibition of First Emperor: China's Terracotta Army was an exceptionally grand occasion, and a lot of cultural exchange programs were arranged for the large-scale serial activities named "China Now" to be held in 2008. 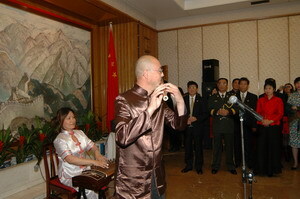 These cultural exchange activities will shorten the distance between the Chinese and British peoples. Fu Ying said she has exchanged opinions with the Secretary of State for Foreign and Commonwealth Affairs, the Secretary of State for Defence and several MPs of the Labour Party while present in the Labour Party Conference not long ago and got a unanimous and powerful signal that the UK government is willing to strengthen its dialogue with China and tighten the economic relations of the two countries. Fu Ying also briefed the guests on the telephone dialogue between Premier Wen Jiabo and Prime Minister Brown on the Sino-UK relations and the situations in Burma on September 28. She said that Premier Wen Jiabo expressed deep concern to the current situations in Burma and hoped that relevant sides of Burma could restraint themselves and restores stability through peaceful approaches as soon as possible. China will continue to work with the international community and actively promote to resolve Burma issue. Fu Ying said that Chinese Foreign Minister Yang Jiechi just had a telephone conversation with David Miliband MP, Secretary of State for Foreign and Commonwealth Affairs, and they would meet in New York at the weekend. These facts are good proofs that the political mutual trust between China and UK and the capability of the two countries to jointly respond to the challenges. Fu Ying ended her speech with the poem of Su Shi: "When will the moon be clear and bright? With a cup of wine in my hand, I ask the blue sky." She wished the guests happy Mid-Autumn Festival and blessed life , she also proposed a toast to the Sino-UK friendship and world peace. Lord Triesman made an ardent reply. He said that he was both happy and honored to be invited to the Chinese Embassy in UK in celebration of the 58th Anniversary of the People's Republic of China. He sang highly of the achievements of China in its development in recent years, he said he was not unhappy at all for China surpassing UK and become No. 4 of the world in the economic volume but full of admiration, he hoped to share the success of China through strengthening the cooperation between the two countries. He said that besides mutual benefits in the economic sector, the link between China and UK is also shown in such aspects as the culture, sports and education. China will hold the 2008 Beijing Olympic Games and the 2010 Shanghai Expo in succession and UK will hold the Olympic Games after China in 2012, the whole world is full of expectation to these events. The number of the Chinese students is the largest in all foreign students in UK, he hoped that more British students could go to study in China. He hoped that China and UK could strengthen their mutual-beneficial bilateral cooperation in such fields as the higher education, vocational education and further education. The atmosphere of the reception was ardent and the guests appreciated with great interest zither performance named "Evening Song of Fishing Boats" by Chinese artist Zhu Meng and the Chinese bamboo flute performance named "Travel in GuSu" by Hu Ruijun. The guest sang highly of the development and changes in China and believed that the Chinese economy would maintain its momentum and bring more wonders to the world.